Vein illumination with AccuVein's breakthrough device, many veins that might be otherwise undetectable without a vein locator, can be located and mapped on the patient's skin. When you are performing vascular procedures the AccuVein can help assess or identify veins and map veins while accessing for removal. Imagine how much more effective you would be with a map of the vasculature highlighted on the surface of the skin. 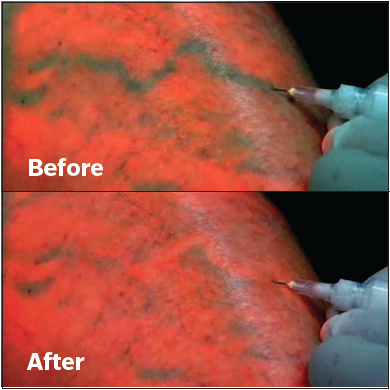 More effective procedures with less patient discomfort result in higher patient satisfaction making it clear why so many facilities have chosen to incorporate AccuVein into their standard of care. For more information on how the AccuVein vein locator can aid in cosmetic procedures, please contact us at +1 (816) 997-9400.